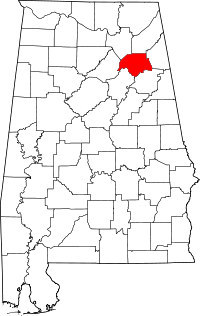 Etowah County was created by the Alabama legislature on December 7, 1866 and was originally named Baine County in honor of General David W. Baine, a Confederate soldier from Lowndes County. The county (i.e., Baine) was abolished on December 1, 1868 by the Constitutional Convention and re-established on the same day, under the name of Etowah, which is from the Cherokee language. Etowah County is located in the northeastern section of the state, in the southern Appalachians. Marshall, DeKalb, Cherokee, Calhoun, St. Clair, and Blount Counties border it. Sand Mountain and Lookout Mountain are located in Etowah County. Gadsden is the county seat, named after Colonel James Gadsden, distinguished soldier, diplomat, and railroad president. Other towns and communities include Altoona, Attalla, Boaz, Gallant (unincorporated), Glencoe, Hokes Bluff, Mountainboro, Ohatchee, Rainbow City, Reece City, Ridgeville, Sardis City, Southside & Walnut Grove. Etowah Ancestry Message Board – Any message posted on this Ancestry board is also copied to the “ALETOWAH-L” [Alabama Etowah List] RootsWeb mailing list … and vice versa. Etowah County Resources – List of links at RootsWeb. Most appear to be for the state of Alabama rather than centric to Etowah. Etowah County, Alabama: Link to Family History & Genealogy, Census, Birth, Marriage, Death Vital Records & More – a Linkpendium site. Etowah County – a Genealogy, Inc. site. Etowah County on USGenWeb Archives Project. Etowah County Cemetery Records from Access Genealogy site. The page lists the cemeteries by name under the site that hosts the record for that cemetery. Note that some sites are not free. Nichols Library – Home of NEAGS with many books on Alabama counties as well as other states. Family histories & family files. See our hours of operation on most pages of this site. Our library is 100% maintained by volunteers from the society. We are there to HELP you do YOUR genealogy research. This was the first lending library in all of Alabama and is unbelievably beautiful on the inside. Gadsden Public Library – Gadsden Public Library has a large genealogy section including microfilm. There is also an “Alabama” history room. Excellent research resource. It is sad to report that the “Alabama” history room has been removed. Note also that the genealogy section has been moved to the 4th floor of the library. You may have to ask at the front desk for the elevator location. There are no restrooms on the 4th floor; those are on the 1st floor. Complaints should be directed to the front desk on the 1st floor. What information are you seeking? Are you wanting to know where he is buried or something else? Let me know and I will pass the information along to some of the other volunteers and see if we can help you.